Rock on. Hang loose. Peace out. Gigabit. When a Stage and Talent like each other very much… they book a Gig. It’s a tale as old as time but we’ve updated the story for a new era. A Gig is any event located at a particular Stage where a particular Talent or variety of Talent perform. A Gig can be anything from a General Business band playing a wedding to a Stand-up Comedy routine at a Nightclub to a Rock show in a basement to a Drag show in a Brewery Taproom. A Residency is generally a weekly or monthly repeating series of Gigs featuring a single, consistent Talent or Theme. Examples of residencies include Saturday Disco Night with DJ Mirror Ball or Tuesday Night Trivia or Live Karaoke Band First Friday of Every Month. Residencies are common among bars and clubs of all kinds because they encourage repeat customers by providing routine, reliable, high-quality live entertainment. How do I make my establishment a Gigabit Stage? If you want to book only the highest quality live entertainment and don’t want any more stress, just reach out to us at info@gigabit.live and let us know what your specific needs are. We’ll perform a FREE on-site consultation and help you find the right live entertainment strategy for your establishment. We work with any budget and any production constraints and on any timeline so don’t hesitate to contact us! How do I book a Gig or Residency with Gigabit? Once we set up your Stage in our system, you will have the option to work with a Gigabit Live Agent to find the perfect Talent that suits your live entertainment needs or take matters into your own hands and book all by yourself with our NEW APP called Gigabit Stage (Beta)! You set up exactly how you want to craft the Gig and a Gig or Residency Agreement, reflecting all of your custom parameters, is sent to the Talent for confirmation. Once all parties accept the Terms of the Agreement, the Gig or Residency is CONFIRMED and BOOKED! Ok. The Gig is Booked. Now What? Time to promote, promote, PROMOTE! Getting the word out about your Gig or Residency is the most difficult but the most important thing you can do. If you’re a Stage booker, check out our Stage Promotion Checklist to get you started with promotion. If you’re Talent or Talent Management, check out our Talent Self-Promo Checklist! What if the Talent cancels the Gig? 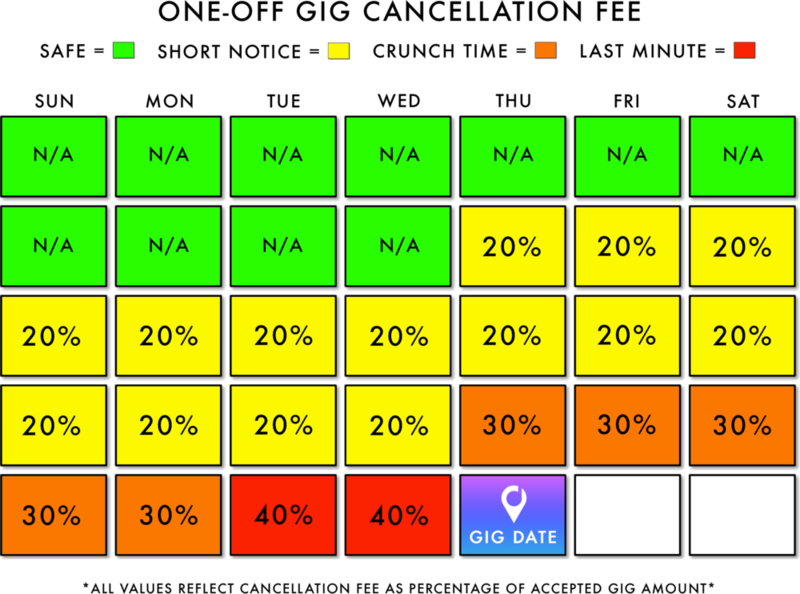 If the Talent cancels the Gig at any time within 3 weeks of the Gig Date, their Talent account is automatically flagged within our system and faces suspension or permanent removal from the Gigabit Talent Network pending Gigabit review based on the reasons for cancellation. Stages may not seek monetary recompense from the Talent as recourse for cancellation. IMPORTANT: Oh no! You unexpectedly need to cancel a Gig. We get it. Sometimes you need to cancel a Gig. All Gig cancellations made prior to 3 weeks before the Gig Date accrue no Cancellation Fee! Cancelling within 3 weeks of the Gig Date will result in a Cancellation Fee as described in the table below. Cancelling within the Short Notice period (21-8 days) results in a 20% Cancellation Fee. Cancelling within the Crunch Time period (7-3 days) results in a 30% Cancellation Fee. Cancelling within the Last Minute period (2-1 days) results in a 40% Cancellation Fee. Cancelling Day Of, you are responsible for 100% of the agreed upon Stage Payment. Our Gig + Residency Rules protect both “Talent” (musicians, comedians, event hosts within the Gigabit Talent Network) and “Stages” (any person or establishment with a Stage account) who confirm a “Gig” or “Residency” by mutually accepting the Terms of a Gig / Residency Agreement. Our Gig + Residency Rules accomplish the following 2 things: (i) Ensuring partial compensation for Talent in the event that a Stage cancels a Gig or Residency without 3 weeks notice and for any reason other than a “Force Majeure Event”. (ii) Providing recourse for Stages in the event that Talent cancels a Gig or Residency without 3 weeks notice and for any reason other than a “Force Majeure Event”. A “Force Majeure Event” occurs only when a party is unable to comply with the terms of the Gig Agreement for reasons out of its control including, but not limited to, natural disasters, severe weather conditions, government actions, war, terrorism, riots, strikes, death and acts of God. Gigabit reserves the right to make a determination whether such an event has taken place. Under such circumstances, Gigabit will void the terms of the Gig and fully refund any prior payments made to Gigabit related to the cancelled Gig. In addition, a Gigabit Live Representative will be made expressly available to mediate and assist in the resolution of any additional disputes.